New Freezer…and a New Stove!!! An update to our “Freezer Fundraiser” earlier this month. We just want say thank you to all of you who donated to help get the new freezer for Club Esperanza! 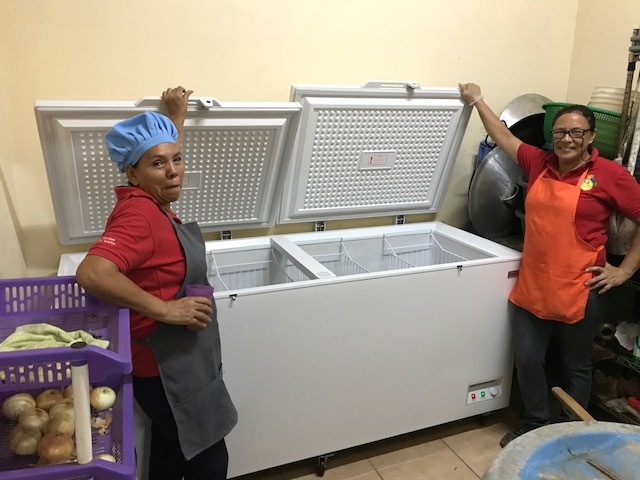 We were able to get the freezer soon after the fundraiser and because of your generosity we were ALSO able to get the new industrial stove needed for the feeding program! (no more mini explosions when the gas is turned off…scary!). Your prayers, your gifts, and your general interest in the children we serve at Club Esperanza really means alot. From the entire staff at the club, and especially the kitchen crew, we are so thankful for these new appliances! The stove made its journey from “Food Machine” (that is the name of the store LOL! ), was loaded on to the back of my truck, and then to its new home with Doña Uvaldina at Club Esperanza. Doña Uva has been cooking since the days we were in the dump of La Chureca. She worked with the old freezer and stove for over a decade. She loved getting the new appliances and passes on a huge thank you as well. She added, that we hope to get another decade out of these new ones! Amen!